I want to share with you all one of my favorite blogs & bloggers! Jenna is the beautiful mastermind behind the blog, Lets Go Sunning. Her blog is a one-stop blog where you get it all - beauty, health, decor, cooking... She is brilliant & has so much greats stuff to share! Today Jenna is popping over here at Scuttle to share a fabulous DIY/Decor project with us, so enjoy! 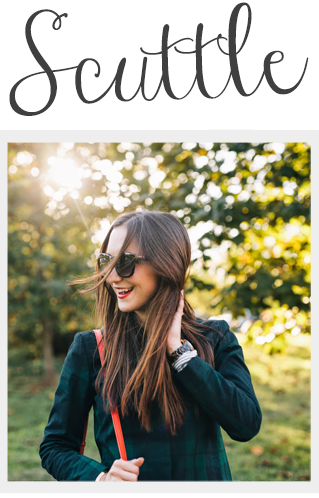 Hello Scuttle Readers! I’ve been trying to spruce up my homes sad little entryway. 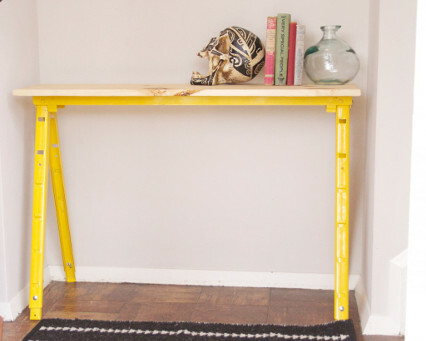 I had decided to try to recreate this West Elm entry table, but in all honesty, it looked exhausting to try to make. I don’t have a yard, or a saw, or a place to hammer wood without someone wanting to kill me, so it was a no-go! After an unsuccessful trip to Salvation Army, I decided to wander around Home Depot and keep an open mind. 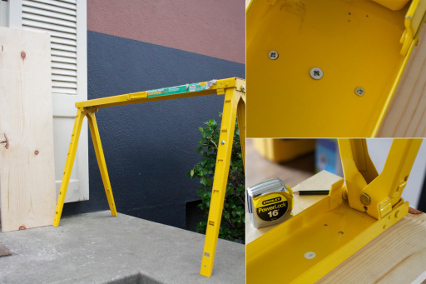 When I found this yellow sawhorse, there was no way it wasn’t going to end up in my house. It was oddly enough, the only one of it’s kind and the label was all janky (woohoo 10% off). 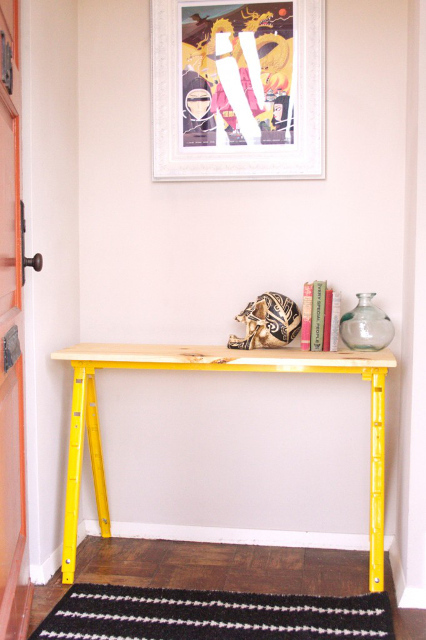 It also was the exact measurements of my little entry nook. Step 1: Treat your surface. I treated my pine board with Howard’s Butcher Block Conditioner (if you don’t have it around the house it is a MUST!). I considered staining the wood, but I decided to keep it simple. Step 3: Using short screws (a little shorter than the thickness of my board I secured the top surface to the sawhorse. Once I flipped it over I had an great little entry table. Of course, this was a complete departure from what I had originally planned, but with some rearranging of kitch and wall art I made myself an awesome entryway. It’s so bright down there now! It’s still a work in progress, but other than a few framed photos I want to add. It’s almost done and only slightly over my budgeted $30. My total came out to $33.89. Not to shabby.